Find a Small Group Ministry session plan entitled Change versus Foolish Consistency for use with Earth Bound on our Skinner House Companion Resources page. "A graceful and inspiring book of wisdom culled from the worlds of spirit and science, philosophy and art. Brian Nelson’s daily musings remind us of both the responsibility and the humanity we share on this earth – and within the embrace of the cosmos." 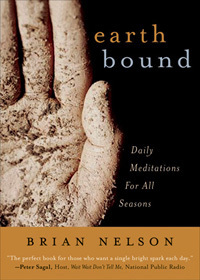 "Like sailing across a river of light, Brian Nelson's Earthbound is a journey of awareness and hope; a gentle, passionate song of unity with nature and understanding of men, of tolerance and faith and the everlasting truth each of us holds in his soul."